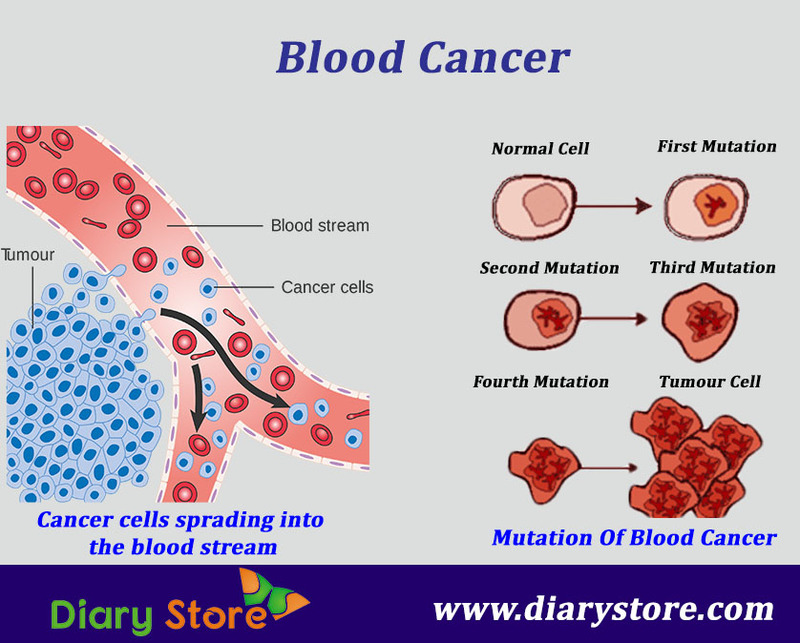 Blood Cancer- When human blood cells grow abnormally in an uncontrollable way, the immunity system is adversely affected leading to a plethora of complications and such a situation is called blood cancer. The abnormal growth of blood cells is attributed to the unusual abrupt change in the DNA of chromosomes, an internal part/organelle of blood cells. Healthy human blood is in the constant process of developing new blood cells, their growth and routine riddance of dead/defunct cells. When new abnormal blood cells take birth and grow limitlessly due to their internal genetic bizarre change called “mutation”, the new cells continue to increase in number without undergoing any eventual death. The condition where new and older defective cells do not die without allowing space to new blood cells gives rise to accumulation of plethora of cells which affect the proper functioning of existing healthy cells. The piling up of unwanted malfunctioning new cells detrimental to the normal human health is referred to as blood cancer. In addition to the above three, there are equally harmful varieties such as myelodysplastic syndromes and myeloproliferative neoplasms which cannot be grouped in the above types. Depending on the speed of spread/proliferation of abnormal blood cells, blood cancer can also be categorized into “acute” and “chronic”. In acute blood cancer, the cancer cells grow quite rapidly and spread out very fast. On the other hand, the chronic cancer cells grow and spread relatively slowly. The birth, growth and replacement of dead cells by new cells are a continuous activity in a healthy system. There is a substance called DNA present in small sections known as genes packed in the internal organelles “chromosomes” in every cell. The DNA is made up of a specific code that controls the activities of birth, growth and replacement of dead/defunct cells. Blood cells are generated in bone marrow from their rudimentary forms called stem cells. If the DNA in the stem cells undergoes weird sudden change, then the cells begin to develop into strange entities and they fail to die when they are supposed to. The peculiar cells thus formed multiply themselves unleashed and their population grows unhindered since the older ones do not perish as in the case of normal healthy cells. These harmful cells are called cancer cells or cancerous cells. 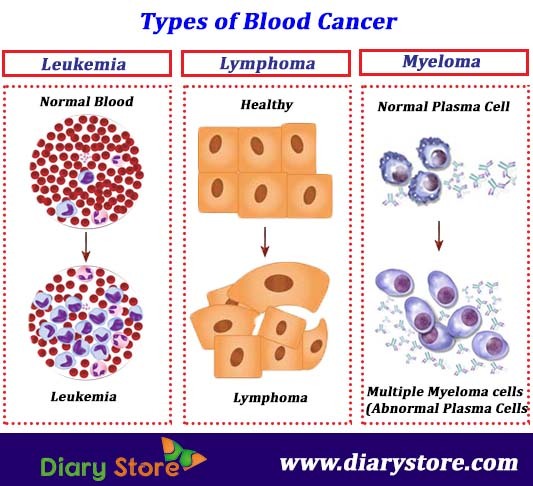 The classification of blood cancer is done on the basis of the nature of the blood cells affected by cancer. Human blood is made up of the RBCs, WBCs, Platelets, minerals, proteins and other nutrients. RBCs are the red blood cells and WBCs are white blood cells. RBCs are also known as red blood corpuscles (technically called erythrocytes), WBCs are known as white blood corpuscles (leukocytes) and the other name for platelets is thrombocytes. The prime function of RBCs is to transport oxygen and energy to different organs from lungs and carrying back carbon dioxide to lungs, waste materials to kidneys. The main job of platelets is to help in clotting the blood at the site of injuries to the body, preventing bleeding/loss of blood. Blood Cancer mainly affects WBCs, although in some cases RBCs and platelets are also affected. The white blood cells act as defence system to fight against any harmful bacteria or viruses that enter the body. WBCs are the major segment of the immune system in human body. Based on the type of WBCs turning cancerous, blood cancer is divided into three categories. Leukemia – When WBCs become cancerous, the entire immunity system of human body is adversely affected and debilitated. The body becomes prone to a host of allergies and infections. Such a condition is called Leukemia. Lymphoma – The Lymphoma is a harmful condition when a particular type of WBCs called lymphocytes become cancerous. Myeloma – This is another pernicious condition wherein a specific sub-type of WBCs, called B-lymphocytes turn themselves into malevolent cells, disabling the immunity system to fight against infective bacteria and viruses. Furthermore, there are some other types of blood cancer viz., myelodysplastic syndromes and myeloproliferative neoplasms. Myelodysplastic syndromes are a set of conditions wherein white blood cells formed newly do not grow into healthy cells but continue to grow in number in spite of their poor efficiency. For sometime, it was perceived as a preliminary stage with huge potential of developing into full-blown lethal cancer. Now it is considered as one of sub-types of cancer which assumes life-threatening proportions in about one-third of patients. The treatment to MDS involves stem cell transplantation, administering medicinal drugs for increasing blood cell count, chemotherapy etc. Sometimes there can be an overproduction of blood cells, RBCs, WBCs and platelets which interfere with normal circulatory system of blood in human body. Certain cases of myeloproliferative neoplasms can develop into myelodysplastic syndromes. The treatment to MPN depends on its specific type that has affected the patient.